This easy one pot instant pot vegetable curry recipe (instant pot vegetarian curry recipe) will help you to make simple and delicious vegetable curry or South Indian Kerala style vegetable kurma for chapathi, poori or rice. This easy easy instant pot mixed vegetable curry is a simple and delicious instant pot vegetarian curry recipe using few mixed vegetables perfect to be used as a vegetarian side dish with rice or chapathi (Indian bread) for dinner or lunch, but this recipe is not vegan as we use butter to add flavor to the curry . If you wish to make this dish vegan, you can replace the butter with coconut oil without losing any flavors! 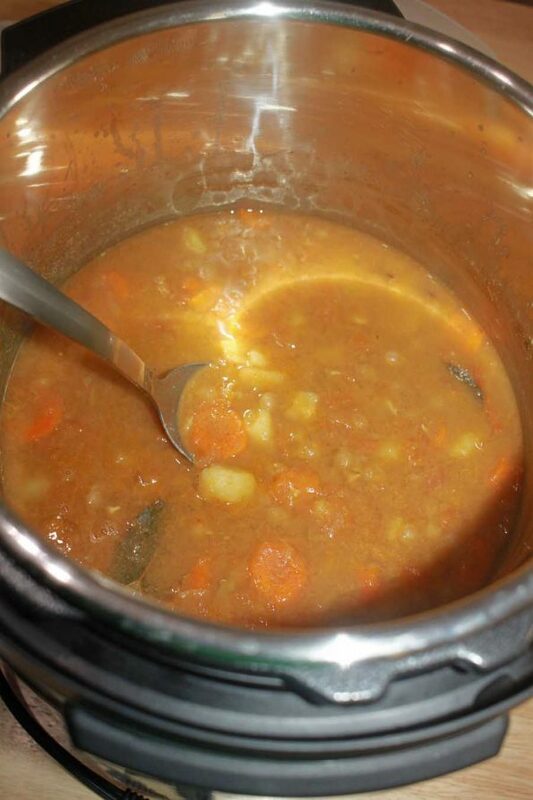 We make this mixed vegetable curry in instant pot using green peas, potatoes, carrots etc. If you like to see more South Indian style instant pot curry recipes, see this easy instant pot green mung bean curry recipe here. You can see all instant pot vegetarian recipes in this blog here. You can use fresh peas, frozen peas or dry green peas to make the curry. 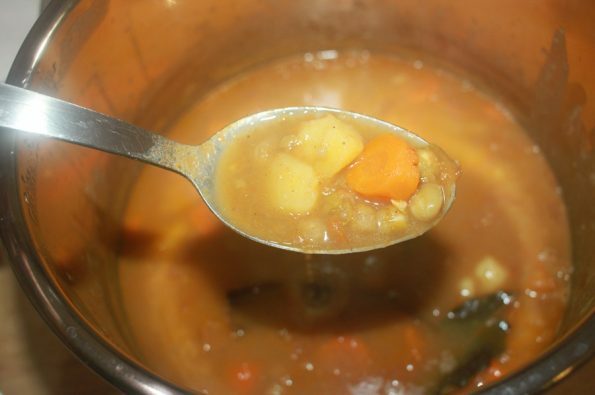 I am using dry green peas in this instant pot vegetable curry recipe, so I will have instructions to soak the dry peas in advance before adding them to the pot to cook along with other veggies. However if you are using fresh or frozen peas, you can skip the soaking part and directly add the peas in the instant pot along with other vegetables. You can choose to prepare the South Indian style seasoning (using oil, mustard seeds, curry leaves, chilies etc) in the beginning of making the curry using the instant pot itself or you can prepare this in a separate small pan and add it to the curry towards the end of making the curry or you can totally skip the seasoning to keep it even more easy and simple. I will have instructions in the recipe to do the seasoning if you like. 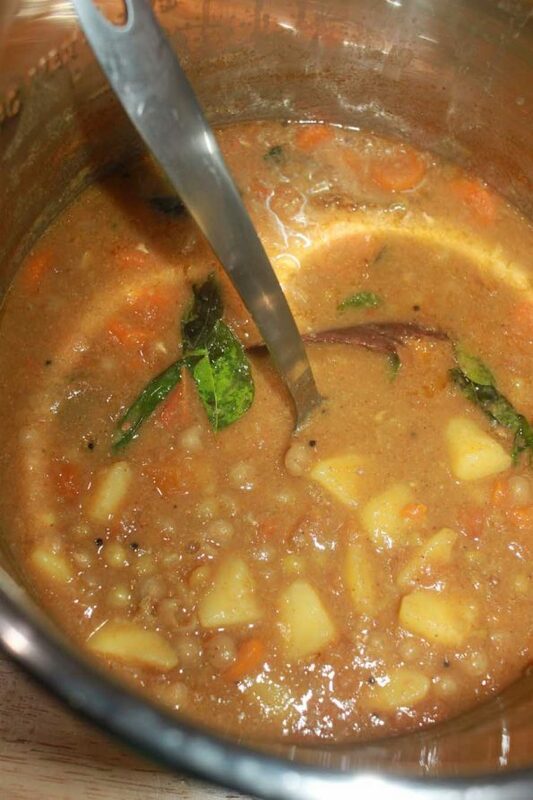 So here is how you can make the instant pot mixed vegetable curry/kurma for chapathi, rice and poori following this easy South Indian Kerala style instant pot vegetable curry recipe. You can easily prepare this amount of mixed vegetable curry using a 6 quart instant pot. This easy South Indian Kerala style instant pot vegetable curry or vegetable kurma/korma goes great with rice, chapathi, poori or even dosa as a simple and yummy side dish using mixed veggies and spices which you can quickly prepare in the instant pot. 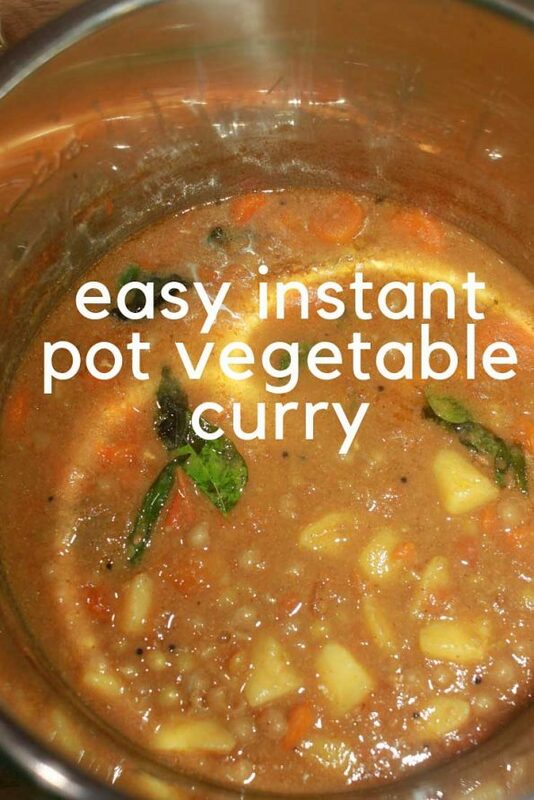 This is an easy instant pot vegetarian curry recipe which can be used to make some quick curried vegetables for lunch or dinner. You can easily make this a vegan curry if you replace the butter with coconut oil or any other oil or you can totally skip it if you want to reduce the amount of fat. Wash and soak the peas for 6 to 7 hours or overnight for best results. After soaking, discard the water used for soaking and wash the peas in fresh water again, keep this aside. Wash and peel the potatoes and carrots, cut in small sized pieces, keep aside with the peas. Wash and chop the tomatoes too and keep all chopped veggies aside. Set the pot in saute mode in 'low' and add the one tablespoon of coconut oil. Add the mustard seeds (or cumin seeds) and when the mustard seeds splutter (or when the cumin seeds are lightly browned), add the dry red chilies and fresh curry leaves, lightly fry for a few seconds. Immediately Press the 'keep warm/cancel' button which will stop the sauteing functions. If you do not want to make this optional seasoning, you can skip these two steps and go to the next instructions directly (you may also prepare this seasoning or tempering in another small pan and add it to the curry once the curry is prepared if you do not want to make this as a one pot dish). Add all the veggies to the inner pot, add enough salt, water, green chilies, coconut oil and all spices to the pot. Stir everything well, close the pot with lid in sealing position. Press manual and pressure cook in high for 8 minutes. Once the cooking is done, pot will beep and press 'keep warm' button. Allow the instant pot to naturally release all pressure. If needed you can do a manual release after about 15 minutes of NPR (natural pressure release) carefully. Once the pressure is released, carefully open the pot by turning the lid onto venting position. Stir well and press saute function and simmer in normal mode for another 2 to 3 minutes until the desired thickness for the gravy is reached. As I mentioned above, preparing the seasoning is totally optional and you may also prepare the Indian style seasoning (using oil, mustard seeds, curry leaves and chilies) separately and add this to the prepared curry at the end if you like it that way. If you are using fresh or frozen peas, you may reduce the cooking time to 6 minutes instead of 8 minutes for best results. Instead of coconut oil, you may use any other oil like canola, sunflower or olive oil or you can also use butter if you want to make it more rich and flavorful. To make it even more delicious, once the curry is prepared you can add 2 tablespoons of heavy cream or coconut milk and stir well until well blended which will make the curry more creamy and yummy. 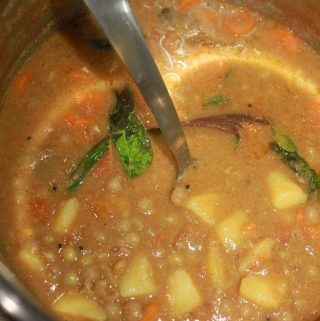 Hope you found this post on instant pot vegetable curry recipe helpful in making easy and delicious South Indian style vegetable curry for chapathi, poori or rice.